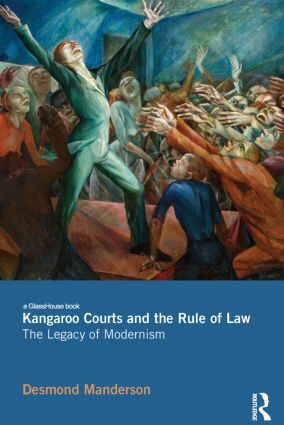 Kangaroo Courts and the Rule of Law -The Legacy of Modernism addresses the legacy of contemporary critiques of language for the concept of the rule of law. Between those who care about the rule of law and those who are interested in contemporary legal theory, there has been a dialogue of the deaf, which cannot continue. Starting from the position that contemporary critiques of linguistic meaning and legal certainty are too important to be dismissed, Desmond Manderson takes up the political and intellectual challenge they pose. Can the rule of law be re-configured in light of the critical turn of the past several years in legal theory, rather than being steadfastly opposed to it? Pursuing a reflection upon the relationship between law and the humanities, the book stages an encounter between the influential theoretical work of Jacques Derrida and MIkhail Bakhtin, and D.H. Lawrence's strange and misunderstood novel Kangaroo (1923). At a critical juncture in our intellectual history - the modernist movement at the end of the first world war - and struggling with the same problems we are puzzling over today, Lawrence articulated complex ideas about the nature of justice and the nature of literature. Using Lawrence to clarify Derrida’s writings on law, as well as using Derrida and Bakhtin to clarify Lawrence’s experience of literature, Manderson makes a robust case for 'law and literature.' With this framework in mind he outlines a 'post-positivist' conception of the rule of law - in which justice is imperfectly possible, rather than perfectly impossible. "Desmond Manderson’s fantastic book shows that literary jurisprudence is just that; a provocative, creative conjunction that pushes both disciplines to offer new insights into our troubled condition. This is the book that law and literature scholarship has been waiting for." "Manderson is a multitude. A concert pianist, a sociologist of law, a literary critic, and a phenomenological legal philosopher, he has in Kangaroo Courts, brought all his polymath skills to bear in a consistently brilliant excoriation of law and literature. This is a work that exemplifies the singular universal. It is a study of a single book that will change a discipline, it is a meticulously close reading that invokes a wholly new philosophy of law. This is that most rare of works, an ode to scholarship, a love letter to the possibilities of law." Desmond Manderson is Future Fellow at Australian National University where he is jointly appointed in the College of Law and the Research School of Humanities and the Arts. His interdisciplinary scholarship in law and the humanities spans legal theory, history, literature, art, and philosophy. Recent books include Songs Without Music: Aesthetic Dimensions of Law and Justice (2000), Proximity, Levinas and the Soul of Law (2007), and Essays on Levinas and Law (2007).